US and Worldwide or NZ and Worldwide. 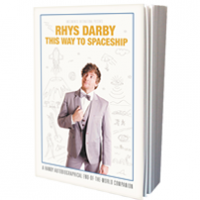 If the world really does end when the Mayan calendar runs out on 21 / 12 / 12, Rhys Darby has a plan. He is fairly sure that the superpowers will have spaceships to evacuate VIPs from earth. The question is, has he done enough to get on board? A cool book. You should buy it. Now available on Amazon.com. 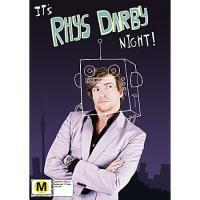 The second comedy special from standup Rhys Darby filmed at the Mighty Civic in Auckland, NZ after touring LA, UK, Australia and NZ. This is cool. You should buy it. 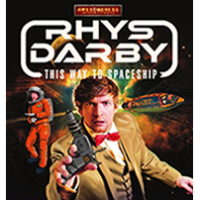 Rhys Darby returns with his third comedy special, This Way to Spaceship, a loosely autobiographical science fiction standup comedy show based on the bestselling book of the same name. From meek-geek to king of cool, this is the story of the nice guy finishing first. It’s cool. Get it now on iTunes.